The Pixel XL is a premium smartphone at a premium price, but it offers premium experience. And thanks to that glass panel on the back, there'll be no mistaking that you're carrying the hottest Android phone in town. Google is finally taking the smartphone fight seriously, launching two new handsets with one simple message: Pixel, Phone by Google. That might sound like a slightly gawky message, but it's laced with potency. More than at any other time in the history of Android, Google is taking the fight directly to Apple, and the Pixel is the punch into the soft belly of the iPhone. This is the Google Pixel XL, the larger of the two Pixel devices, and it's Android's new heavyweight champion. Each Pixel device that Google has announced has shared the same quality: an uncompromising approach to design. With the Chromebook Pixel, the first of this new family, an eye-wateringly beautiful laptop was born. The Pixel C tablet followed suit. And now we have the Pixel and Pixel XL smartphones. Like those previous devices, the Pixel XL pulls no punches. It is cast from a block of aerospace-grade aluminium, anodised for a finish that's as premium as you'll find on any smartphone, with shapely chamfers to the front and curves to the back. In a world where a phone is a slab dominated by the display, the Pixel XL manages to be different. The handset has a polished glass section set into the rear, where the camera and fingerprint scanner sits. Its purpose remains something of a mystery, other than giving this phone a distinctive look. If you wanted to do something to ensure that no one was going to say it was an iPhone clone, that might do it. At first we were unsure about this detail. It seems to serve no purpose, but as we've used the phone more and more, we've come to love the smooth feel of the glass. It's interesting, it's different and - remarkably - it's unique. From the front the Pixel is less unique. Arguably, if there's one criticism we'd bring to bear against it, it's the height of this phone (at 154.7mm). We criticise the height of the iPhone 7 Plus for the same reason, because there's a little too much bezel above and below the display that doesn't really do anything. The Samsung Galaxy S7 edge manages to be shorter and by keeping the controls off the display, makes better use of that space. We think that the S7 edge is the Pixel XL's most natural rival: Samsung's phone is a masterclass in Android adaption, a juxtaposition of Google's Pixel purity. Samsung also offers waterproofing, which is another Pixel weakness - the XL is an IP53 device, for fleeting rain splashes only - although some users are finding the Pixel will survive a dunk in water. When you're choosing between the Pixel and the Pixel XL, there's one difference: the display. Topped with Gorilla Glass 4 to keep scratches at bay, the 5.5-inch display of the XL puts it in an incredibly popular class of big phones. The Pixel XL lives up to its name with a 2560 x 1440 pixel resolution display, resulting in a pixel density of 534ppi. Quad HD is very much the current standard in flagship phones - the Sony Xperia Z5 Premium went one better with its 806ppi 4K display - but the Pixel XL is every-inch competitive with its rivals. Opting for AMOLED, Google's display choice is fantastically detailed and offers bags of punch and vibrancy. It doesn't push the vibrancy quite as vigorously as Samsung often does so it strikes a more neutral balance. There's richness to colours, deep blacks and nice clean whites, although the latter are slightly on the warm side, not that it matters a great deal. One of the new additions to the Pixel XL is Night Light. This changes the colour temperature of the display in the evenings so it doesn't drown you in blue light and stop you sleeping. It's hardly unique: Apple offers the same, as does Samsung. On the Pixel it's a standard Android feature, so will soon be commonplace we suspect. The one downside of Night Light is that it will taint things like videos you might be watching and as it's linked to sunset and sunrise, for those living nearer the poles with long dark winters, you might find that Night Light switching on a 4pm is a little depressing. Fortunately, there's a toggle in the quick settings to turn it on and off. We found the adaptive brightness to be good: there's enough brightness to cut through sunny conditions, and it dims well enough for night-time video watching. We also found the screen's polarising layer to be cleverly positioned so the Pixel doesn't blackout in portrait or landscape if you're wearing polarised glasses. Launching late in the year, the Pixel XL comes up against comparable rivals that have been on the market for some time. There's a small advantage in that it offers the new Qualcomm Snapdragon 821, with 4GB RAM, which is a minor upgrade on one of the year's most popular quad-core chipsets. Flagship specs mean flagship performance and the noticeable thing about the Pixel XL is how smooth and fast it is. Much of this will come down to the clean Android build - as there's no bloat - which we'll cover in the software section later. Importantly, the Pixel XL behaves like the flagship phone that it is. It's fast to open apps, it's fast to react to your commands. For those on the EE network in the UK, it's fast with data too - with top performance when it comes to signal and reception. There's the option for 32GB or 128GB of storage and as anyone who owned a Nexus will tell you, there's no provision for microSD card expansion here. That's a downside compared to many flagship Android phones. Sure, Apple has never offered expandable storage and that works for iPhone; Android does and in this new competitive "phone by Google" world, customers will expect such features. There's also a fingerprint scanner on the rear, as we mentioned. We're happy with it's positioning, it worked for the Nexus 5X and Nexus 6P - and it works here. The fingerprint scanner is easy to find and very quick to unlock the phone. Perhaps the only thing to watch out for is the new swipe gesture (or Move as Google calls it). This allows you swipe down the notifications shade to glance at your alerts and messages, and we've found it very easy to accidentally swipe when handling the phone. Not that it matters much. There is one speaker in the bottom of the Pixel XL. This provides plenty of volume, but isn't the most accomplished speaker on a smartphone, lacking the smart separation and bassy punch of HTC's BoomSound. It will also distort at high volumes, so you're better off with headphones. Sitting inside the Pixel XL is a 3,450mAh battery. That's likely to put a smile on your face for starters, as generally devices with batteries over 3,000mAh do pretty well in getting you through the day. Indeed the Pixel XL does offer good battery life. It's got us through the day without the need to visit the charger for a top up. We've enjoyed day-long battery, even with that necessary Pokemon Go session while out walking the dog. We've been using the Pixel XL since launch and have found the battery life to be good over the past months. You can head out the door knowing that you'll have battery life when you get home again. The XL does offer a battery saver mode, too, but it's the native Android offering and is rather basic. Google will tell you that Android Nougat offers great Doze battery saving without you having to do anything: but sometimes we just want to toggle on a mode to ensure we're not wasting power we don't need to. There's a USB Type-C connection on the bottom of the Pixel XL and this offers fast charging, so if you do run short of juice then a quick blast will have you back in action again. However, there is no wireless charging. 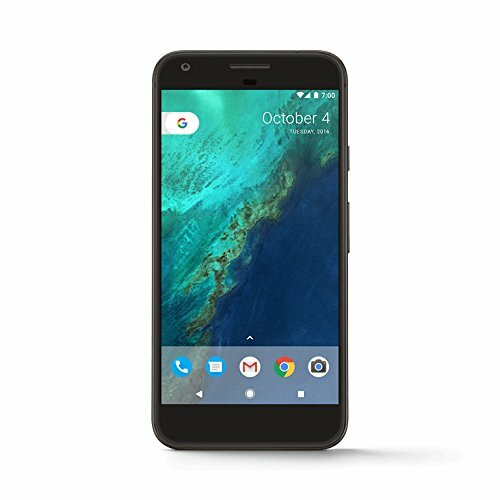 The Pixel XL launched on Android 7.1 Nougat, and has since been updated to Android 7.1.1, bringing with it a number of unique Pixel features, designed to make this device stand-out from other Android phones and to offer a little more than previous Nexus devices of old. Google Pixel vs Google Nexus: What's the difference? That really draws a line between the Pixel and previous "Google" phones. In the Pixel you have an "exclusive launcher", the integration of Google Assistant voice-control on the home button, a unique camera experience, a calendar icon that shows the date rather than just "31" and a few other bits. Again this follows Google's narrative of the Pixel being a more complete and appealing proposition and we have to say, Android is very slick on the Pixel XL. It feels sophisticated, a proposition that's much more consumer than some Nexus devices of the past. One of our favourite features isn't exclusive, as it's coming in Android 7.1: app shortcuts. It replicates the sort of thing that you get with a deep press on Apple's iPhone with 3D Touch, but on the Pixel it's just part of the software system, rather than needing a hardware change. These app shortcuts allow you get right back into a conversation, open the camera to take a selfie or open a new Chrome Incognito window without having to open the app first. Currently this only works on Google's own apps, but we're sure it will come to many other apps soon. It's one of a few small changes in Android that's making everything more immediate, like the proper integration of replies into notifications and more information in the settings menu, so you can see important details at a glance. There will be a brief window where the Pixel is the most Google-y Android phone around, but with updates coming, a lot of the refinement will be flowing through to other devices. We love the purity, something that's become increasingly consumer friendly on recent Nexus devices, and in the Pixel this refinement is at its purest. Where the Pixel perhaps isn't as exciting as some other devices is in the apps tray. Although it's accessed with a swipe through Pixel Launcher, the apps tray is a fairly basic layout, with no customisation options. You can switch launcher, of course, and the Google Assistant shortcut on the home button will stay in place, but you might lose those fancy app shortcuts in the process. One of the top billings for the Pixel is Google Assistant. There's been a lot about how Google is pushing its artificial intelligence system forward. In reality, Google Assistant is an evolution of existing systems established by Google Now and at a surface level works in a similar way. Google Now has always been about tailoring information for you and Google Assistant does the same. What is Google Assistant, how does it work, and how can you use it? Google Assistant is accessed via the "Ok Google" hot word and the real change here is in the visual presentation. It can also be accessed from the Pixel Launcher with a long press on the home button. Where once you had Now On Tap you have Google Assistant instead. That sort of makes sense too, as Google Assistant is designed to be contextually aware, integrated and capable of serving a wide range of your needs. Aside from presentation of results, it's the ongoing conversation with Google Assistant that makes it different - being able to extend a question or topic to find more or do more. Currently though, it doesn't feel much like a breakthrough into an AI future. Yes, Assistant will do things for you, but it isn't a vast change from existing voice interaction with Google. We're sure that position will change with the launch of Google Home, where Assistant will have a range of tasks to perform that currently don't surface on the phone. Like Siri on the iPhone, we expect to be able to tell Assistant to dim the lights from our Pixel in the future. There are some cool things that you can do however. We've previously seen integration into Google Allo, the new messenger app, but now you get that outside of Allo - you just have to start talking to Google. There's some app integration, like you can say that you want to watch something on Netflix and it will open on that programme, for example, which is clever. The same has worked for Spotify for some time. There's also clever intrgration with Google Photos and the camera - you can ask Google Assistant to find pictures of your dog, or ask it to take a selfie. Finding things and developing that information can be pretty good, but on many occasions Google Assistant will serve you up a search result and read the answer. That's ok in dealing with a question - like "what is a dangling participle?" - but currently it seems there are a number of dead ends. The camera is one of the other areas that benefits from some software exclusivity. Unlimited backup storage for full resolution of photos and videos is a serious proposition and applies to all photos and video you take on your Pixel, along with smart storage that will erase backed-up photos from your device as storage needs increase. No worries about running out of space on the Pixel XL. The camera app makes a step forward towards usability, too, coming from a position of relative weakness in previous years. Nexus devices never really did well in the camera department until the Nexus 6P shook things up in 2015 with its great performance. However, the Pixel app is still rather basic. Gunning for the iPhone means delivering on the camera and the Pixel aims to deliver a simple camera that works. The bad news is no real manual controls and very few menu options. The good news is that you can pretty much just point and shoot and you'll usually get good results, which is the important point. The 12.3-megapixel camera on the Pixel XL is very fast to capture. It employs auto HDR+ (high dynamic range) as a default to make the best out of scene. We're fans of that setup on phones like the Samsung Galaxy S7, as these days it generally means you get great results in a wide range of conditions. Here you can engage HDR+ proper, or leave it in auto mode which is faster and the results aren't hugely different. Indoors it is prone to white balance mishaps however. On both the Pixel and Pixel XL, we've found some indoor shots that look very yellow, as though it's misinterpreted the conditions. That can be corrected by manually selecting the white balance and perhaps switching to "tungsten", for a more natural look, but it persists as a problem even some months after launch. With 1.55µm pixels in the sensor and f/2.0 aperture, low-light performance is pretty good too although there's no optical image stabilisation. In lower light there's fine grain which can reduce the contrast and detail. In very dark conditions image noise crashes in and with no options for manual lengthy exposures or anything else, it's not really a "pro" camera in that sense, more a reliable point-and-shoot. Google has clung on to some of the old Google Camera features in its Pixel Camera which are less exciting: Photo Sphere remains an option, as does the old Lens Blur option, which gives you a sort of bokeh effect. The fun addition is slow motion video with 120fps and 240fps options, with the easy option of selecting the portion you want in slow-mo. Elsewhere video capture offers 30fps and 60fps up to Full HD, with 4K video offered at 30fps. Video stabilisation is effective, so you can walk down the road and get pretty smooth results. This is all effortless too, which is great. Overall, we feel that the Pixel XL could make more of its camera with a more encompassing app. For those wanting to push the camera's capabilities, the answer might lie in a different app. However, as many iPhone owners will tell you, often it's just about pointing and shooting. In these conditions, the Pixel XL delivers. The Pixel XL is the most accomplished phone that's come from Google. The dabs of consumer refinement that Pixel has applied makes the Nexus programme feel like beta testing. And Google loves beta testing, so in many ways the Pixel is the result of learning through all those Nexus phones. The XL is a pure delivery of Android: it's fast, it's fun, it's high quality; it has exclusive features, the camera works and the battery lasts too. For many, however, the stumbling block will be the price. The Pixel XL is priced to rival the iPhone 7 Plus; not undercut it, but to look it straight in the face and stare it down. The Pixel refuses to accept the position that Android offers you more for less, because as it is, the Pixel will struggle to answer questions from the much cheaper OnePlus 3 or the slightly cheaper Samsung Galaxy S7 edge. Fortunately the Pixel XL delivers. It's a premium smartphone at a premium price, but it offers a truly premium experience. And thanks to that glass panel on the back, there'll be no mistaking that you're carrying around the hottest Android phone in town. Originally published 18 October 2016.